August Belmont II is rightfully remembered as one of the titans of the turf. He came by his lofty standing through his father’s prominent role in American racing. August II inherited the family love for the sport and built Nursery Stud into a powerful and prestigious breeding operation. Belmont Jr took what he learned and inherited to the top of American thoroughbred breeding/racing during his lifetime. His father August Belmont I was a prominent businessman/financier who became a leader in the formation of success New York racing attained during the nineteenth century. The senior Belmont associated with Leonard Jerome, and between the two both men laid the groundwork for the sport to flourish. August Belmont I set up two breeding centres named Nursery Stud, one on Long Island and one in Kentucky. He later closed the Long Island farm because he surmised that the climate and soil in Kentucky were better suited to raise horses. The Belmont Stakes and the grand track that race is run at were named in his honour. The son delved into the sport to such an extent that he was literally the face of racing. He served as the chairman of The Jockey Club at the dawn of that organisation to organise and rule the sport. He was also the chairman of the New York State Racing Commission, created to regulate the rules. All the while he was entrenched with these high profile positions, August Belmont II was breeding and supplying some of the finest horses to grace the American turf. August Belmont II would breed one hundred stakes winners in his illustrious career. There were many bred through the bloodstock he inherited, but many more came through his own breeding principles and theories. Belmont bred for sound, stamina rich horses. He once famously told a younger William Woodward when that future titan of the turf was beginning his foray into racing “Billy, breed for stoutness. If you get one that is also fast, then you have a champion”. Although the term “Classics” was not in vogue at the time, Belmont bred horses with those objectives in mind. The American Triple Crown had not been set up, although all three races were annual events on the calendar. August Belmont was essentially laying the foundation through his breeding program for future “Classic” winners once the term became the standard. Belmont frequently purchased and imported mares from England looking for the classic stamina he coveted. One of the key mares in Belmont’s broodmare colony was a daughter of the great English race horse and sire Bend Or. Her name was Fairy Gold. She won a pair of stakes races in her native England before she became a broodmare. Belmont purchased her in 1903 and brought her to the U.S. She was bred to the savage stallion Hastings, a stallion Belmont stood at Nursery Stud. The resulting colt foal was Fair Play, who possessed much of his father’s volatile behaviour. Fair Play was a great race horse, but was unfortunate in that he was born the same year as the undefeated legend Colin. Fair Play did win many top class races when Colin was not entered. He had the last laugh from his nemesis however due to his stellar stud career. Fair Play was the leading sire three times in America and is forever known as the sire of Belmont’s greatest breeding achievement, the immortal Man O’ War. Eight years after Fairy Gold produced Fair Play, she produced another flaming red chestnut colt. This one was by the English Triple Crown winner Rock Sand. Belmont imported Rock Sand to Nursery Stud and had great success with his get. The aforementioned Man O’ War was out of the Rock Sand mare Mahubah. By breeding Rock Sand to the dam of Man O’ War’s sire, Belmont was reverse breeding the same strains. However Man O’ War did not come into the world until four years after Fairy Gold’s Rock Sand colt. His name was Friar Rock. Friar Rock looked much like his dam sire Bend Or, and even had some of those famous Bend Or spots in his coat. He was a typical Belmont type of horse with a crafted pedigree that contained selective inbreeding. Friar Rock had Galopin, the sire of St. Simon, twice in his fourth generation. Friar Rock was also inbred 4×4 to Derby Stakes winner Hermit. Rock Sand carried three fourth generation crosses of Stockwell, so with that one’s breeding to Fairy Gold, a fourth cross of Stockwell appears in the pedigree of Friar Rock (5x5x5x4). Stockwell was known as “The Emperor of Stallions” due to his stud success. Friar Rock was not a big horse, but was solidly built with good shoulders and powerful hind quarters. He possessed a deep chest and had very correct legs and feet. Friar Rock was a handsome individual and once under tack, his action was smooth and graceful. His track accomplishments would be far more notable than his now more famous half brother. Future Hall of Fame trainer Sam Hildreth was given the colt to prepare for what would be an exceptional racing career. Hildreth was a very gifted trainer, but his penchant for brawling and other associated activities did not endear him to many established turf luminaries. Belmont felt he could keep a lid on the trainer and employed him because of his innate horsemanship. Hildreth had Friar Rock ready to go as a juvenile, and the colt won five of his twelve races. For a colt that was bred to cover a distance of ground, five wins in a juvenile year was a good omen for the future. Among those five were victories in the Adirondack Stakes and the Whirl Stakes. Friar Rock won his first start on May 26, 1915 at Belmont Park. He also won his second race at the same track, covering the five furlongs in 58 3/5. It looked as if Belmont’s breed for stoutness and hope for speed policy was coming through in Friar Rock. He set three track records in his juvenile campaign. Friar Rock went off form for the last four starts at two and ran unplaced in each of those races. Dominant, who had defeated Friar Rock in both meetings they faced each other, was the consensus choice as the top two year old. Friar Rock showed that he was a game and talented horse. Belmont had good reason to be optimistic for the upcoming season. The first race for Friar Rock as a three year old was a big ask. Hildreth chose the Metropolitan Handicap against older horses. The Triple Crown trail we all are used to was not in fashion in 1916. In the Met Handicap, Friar Rock would be facing the previous year’s champion three year old The Finn. Also in the race was Friar Rock’s stable mate Stromboli who would be attempting to defend his Met Handicap win from the previous year. The Finn won the race as expected while Friar Rock never contended and finished seventh. Hidreth was not discouraged by the result. He entered Friar Rock in the ten furlong Suburban Handicap to again face The Finn and Stromboli as well as Short Glass, another top class handicap horse. Friar Rock was now coming into his top form as he took command of the lead along the back straight and powered through the home stretch to win by two and one half lengths over Short Glass. Friar Rock made his next start in his own age group and entered the Withers Stakes. Sent off as the prohibitive favourite, Friar Rock had a troubled race. When an opening along the rail came his jockey Haynes went for the advantage, but the opening closed quickly and he had to check Friar Rock thus losing momentum and several lengths. Spur won the race over Churchill with Friar Rock behind in third place. The incident in the race left Haynes with severe scrapes on his leg from the inside rail and Friar Rock had some of his gleaming coat covered with white paint. Off his victory in the Withers, Spur was made the betting choice for the next encounter, the eleven furlong Belmont Stakes. Churchill and Chicle were also entered with Friar Rock. The track was a muddy mess on the day but Friar Rock glided over the sticky surface to win by a three length margin. Friar Rock had demonstrated his stamina on the deep track and won the race named after his owner’s family. The next race for Friar Rock came in the Brooklyn Handicap, and a return to facing older horses. Short Glass, Pennant and the formidable Roamer were also in the race. Pennant took the lead in the home stretch and looked the likely winner until Friar Rock unleashed his speed and blew past the older horse to win by two lengths going away. The Daily Racing Form described the stretch run as such, “Every jockey went to the whip in the last eighth and Pennant looked the winner when a sixteenth out. Roamer was done at that point. Friar Rock came out of the pack in the last hundred yards and got up to win in the most sensational manner”. Four days after his Brooklyn Handicap victory Friar Rock was in the Brooklyn Derby against fellow three year olds. Perhaps the race was too soon after such a stirring display because Friar Rock did not have it on the day and finished fifth to Chicle, a horse he soundly beat on two previous encounters. Also ahead of Friar Rock at the wire were Spur and Churchill. Things did not get any better for Friar Rock in his next two races. He fished sixth in the Empire City Handicap and then third to stable mate Stromboli in the Saratoga Handicap. The slump would end in the one mile and three quarter Saratoga Cup. This race was an important fixture on the yearly racing calendar back when Friar Rock ran. His opposition for the race was The Finn and a now in form Roamer. The race was weight for age in conditions so Friar Rock got less of a weight break than he had received from these two in the past. The Finn was favoured in light of his previous outing when he set a new track record in the Merchants’ and Citizens’ Handicap. Friar Rock was the second choice. In a race described by the Daily Racing Form as “A gruelling struggle from the start”, Friar Rock prevailed after letting his foes set a slow pace. Friar Rock engaged The Finn at the top of the far turn. The pace then quickened noticeably as Friar Rock took command through the turn. However Roamer was not done and set down to challenge the three year old. They locked into a thrilling duel that lasted the entire home stretch. Friar Rock on the inside and Roamer on the outside waged an all out battle for race supremacy. With only forty yards to go, Friar Rock’s stamina prevailed and he won the race by a length. The final quarter was run in 26 seconds, which is outstanding considering the fact that they had already run twelve furlongs to that point. Friar Rock’s greatest victory would also be his last. August Belmont II would sell Friar Rock to John E. Madden, a man of equal breeding and racing accomplishments as Belmont, for stud duty. Madden in turn sold a half interest in the colt to California breeder John Rosseter. Friar Rock was immediately retired from racing and as per the Madden and Rosseter deal would stand his first breeding season the following year at Madden’s Hamburg Place farm in Kentucky. The following year Friar Rock would stand at Rosseter Farm in California and then go back and forth each subsequent year. Unfortunately after Rosseter’s first turn at standing Friar Rock he refused to send him back to Kentucky. Rosseter had become so enamoured with Friar Rock that he wanted to keep him on his farm. Madden refused to alter the bargain and wanted his turn every other year. Soon the matter would find its way into the courts and the agreement was dissolved when the best solution to end the standoff would be to sell Friar Rock. William R. Coe bought Friar Rock and stood him at his Shoshone Stud. Friar Rock did not have as much success at stud as did his half brother Fair Play. It has been reckoned in hindsight that the yearly shuttle set up, which included some obscure pedigreed mares in California, and the infighting between the original stud owners did much to hamper his chances for stud success. However there were a few notable names that were sired by Friar Rock, and broodmare daughters that kept his name in upper breeding circles. Friar’s Carse was the champion two year old filly of 1925. She later produced multiple stakes winner War Relic by Man O’ War. This breeding created a close 3×3 inbreed to both Rock Sand and Fairy Gold. War Relic is the sole branch of the Man O’ War tail male line that still carries on today. War Relic was known to be a nasty horse with a quick temper, but his stud achievements have carried him to popular status among breeding historians. Another daughter of Friar Rock to keep his name alive in breeding is Black Curl. She won the Test Stakes, Bay Shore Handicap and the Arverne Stakes during a very solid racing career. Her daughter Black Wave, by Sir Gallahad III, won the Test Stakes also. Black Wave is the dam of Kentucky Derby winner Jet Pilot by Blenheim II. Friar Rock’s daughter Heloise became the dam of champion two year old Tintagel. Rockminster (Pimlico Cup), Cesare, Flintstone, Flat Iron, Conclave (Test Stakes, dam of champion Askmenow), Emotion (champion three year old filly), and multi stakes winner Pilate are more of Friar Rock’s best get. Pilate would sire Hall of Fame inductee Eight Thirty, champion three year old Phalanx, champion two year old Platter, and the successful broodmare Good Example (dam of Exclusive). A tragic son of Friar Rock was Inchcape. He won all three of his races including the Tremont Stakes but had to retire as a two year old due to injury. That was not the tragedy however. 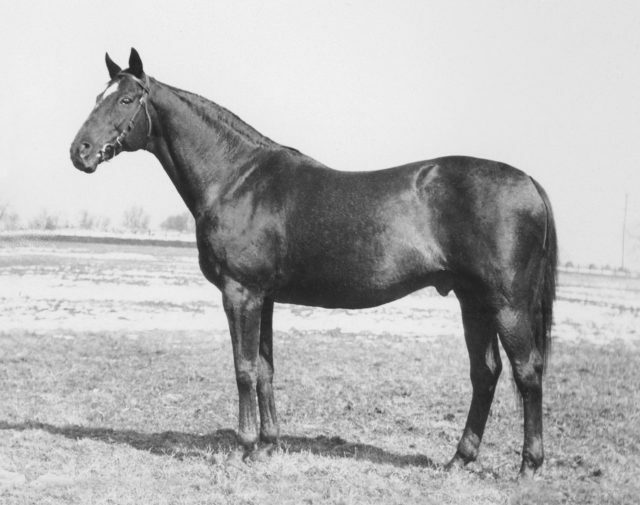 Inchcape was bred to Sweep’s full sister Swan Song and his only foal was born two months after Inchcape and forty other horses perished in a massive barn fire. The filly foal was named Inchcape Belle. She later produced Travers Stakes winner Thanksgiving. Friar Rock was, in the opinion of his trainer Sam Hildreth “The best horse I have ever seen over a distance of ground”. Before the advent of official year end awards, various press and industry officials would nominate horses in the various divisions. In the three year old colt division of 1916 Friar Rock was the undisputed leader. He was also the consensus choice as Horse of the Year. For many years Woodbine Racetrack in Toronto had run the Friar Rock Stakes in his name. Friar Rock was the embodiment of August Belmont II’s breeding policy. He may not have been the best Belmont bred, but he certainly was a fine horse in both talent and looks. He had some of the famous Bend Or spots and transmitted them to much of his offspring. Many of his ancestors were on the cranky side, but he was not quite as temperamental. He had his moments, but Friar Rock was generally pleasant enough. One thing that does stand out with Friar Rock however. He could carry his speed in long distance races and had no equal in doing so.